Silver Streaks, PopUp Problem, Snowmaker Gloves, 70s Ski Test, Mystery Guest, Conditioning Advice, Big Bromley Resort Review. We stopped at Waterville Valley’s Silver Streak corner in the base lodge last Monday to introduce ourselves and spread some SeniorsSkiing.com stickers to the members who had gathered for coffee and donuts. Silver Streaks is a club program that is supported by the WV management with a separate place to park, gather, store equipment, have parties, races, and other special events. Correspondent Tamsin Venn wrote an article about the Streaks in 2015. Click here to read it. 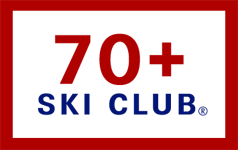 The Silver Streaks is the oldest senior ski program in the country. We think it’s a model for other resorts. But something that one member said got us thinking. We asked if they had heard about SeniorsSkiing.com, and one member said, “How would I have heard about you?” Excellent question and difficult to answer. 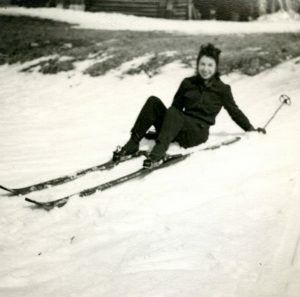 SeniorsSkiing.com doesn’t advertise, we do have a modest Facebook presence, we try to link to other sites and stories. The best and most effective way for new readers to find us is to be referred by someone who is already a subscriber. Please spread the word. We explain our annoying Popup Problem that came with last week’s edition. We are very sorry some readers had an issue with re-entering name and email address countless times. 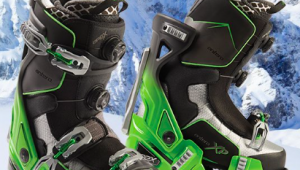 Pat McCloskey gives us a steer to snowmaker’s gloves that really can make a difference if you ski in wet, wet conditions. 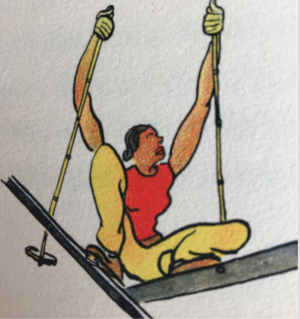 Marc Liebman continues his series on ski testing with an interesting article that describes how the parameters of ski performance were actually defined back in the 70s. Our Mystery Glimpse this week is quite challenging. You might be able to identify the mystery guest, but where did this person stay? There are hints. Orthopedist Dr. Peter Schmaus contributes his advice for focusing your conditioning on core muscles and why that is important, not only for skiing or other snow sports but for living as a healthy senior. Finally, we hear from Tamsin Venn with a Resort Review of Bromley Mountain, VT., a classic ski area with “just right” skiing for seniors. Remember folks, January is Learn To Ski And Snowboard Month. Bring a friend, bring your grandchildren. Get out there and enjoy the cold. Click here for more. Thanks for reading SeniorsSkiing.com. Please tell you friends, it’s how we get new readers. And remember, there are more of us every day, and we aren’t going away.